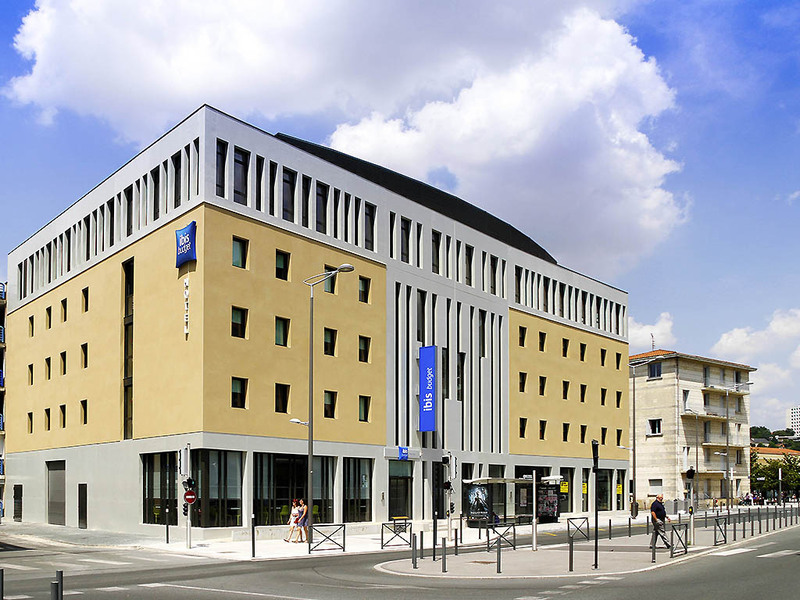 The ibis budget Gare de Poitiers hotel is a short walk from the SNCF station. This hotel, close to the center of Poitiers and 10 minutes from the Parc du Futuroscope, offers modern and comfortable air-conditioned rooms for 1, 2 or 3 people. Also take advantage of a competitively priced full buffet breakfast and free, unlimited WIFI. Very satisfied with friendly staff, the cleanliness and the comfort of my room. It was an ideal hotel for an overnight stay. Being close to the station, an early morning TGV was no problem. Staff was really helpful, when i realise that i have booked the wrong Ibis as the one in the city centre dont have car park, but it is a multi store car park on the side of the hotel where guests have discount. Rooms clean & basic but fine for our short stay. On one morning the room wasn’t cleaned or towels changed. Extremely comfortable rooms, basic, but very clean, good WiFi, breakfast was very good value for money. As ever, stressless. A professional set up with educated and pleasant people. The rooms are just as you describe, with the added extras of good and simple wifi and a very good value breakfast. It was a great experience; rooms are tidy, pricing is great, and the location is very convenient ;pretty close to the train station. Warm welcome and very good followup, especially for me being handicapped. Once again, a warm welcome, clean room, comfortable bed, no noise at all from the busy road or railway station and SO convenient when travelling by rail as only a few meters to walk to catch the train. Breakfast is adequate and plenty of it! Clean, comfortable and quiet as always, as we stay here frequently when travelling ftom Poitiers to Paris by train. As it is next to the station it is very convenient, but the double glazing is so efficient that you wouldn't know it was there. Only disappointments were the lack of pillows this time, as in only one per person and no extra available so had to roll up our coats underneath the one each that was provided. Also only one bath and one hand towel between the two of us and always had one each on previous visits. As the hotel was extremely busy, we reckon this was why and we did not want to queue up at Reception about the towels as there were so many customers checking in. We had already asked re pillows and told there were no additional ones available. The room is quite and clean, nice experience. Excellent reception, very informative regarding the parking setup with EFFIA next door. Room was on the 3 rd floor and was quiet, clean and comfortable. Arrived at the hotel, place was clean and reception staff friendly and helpful. However cleaning staff were pressuring for leaving the room before 12 if we wanted it to be cleaned. Didn't like the feeling. The worse is that on Saturday after my room was cleaned my pair of shoe that i brought for a party was missing. I raised it with the lady at reception. She said she trusted her staff. However on Sunday morning after I left my room to go downstairs for breakfast the shoes were placed back in my room but in the wrong bag (hand bag were they were never stored they were in my hand luggage). I was just so relieved to find my shoes that i didn't take it further. But I felt really bad to think someone could have gone into my bag to still my belongings. Overall i liked the place but this shoes incident was really hard to swallow. Thanks again for the stay. The lobby was dark with no lights on, which was a little disconcerting. The staff person was very friendly though. My room was pretty standard for an Ibis Budget, but it had clearly seen better days - big marks on the wall, broken soap dispenser, etc. Ibis Budget beds aren't my favorite (basically a mattress on boards), but the location is really convenient to the train station for an early morning train. It's acceptable for that purpose, but not somewhere I'd want to stay otherwise. From the time I checked in to the time I left, I was made to feel that the staff was there to manage us so we will give them the minimum amount of work rather than actually being there to provide a service. I travel a lot and checked in around 11pm after a very long train journey. I booked my hotel during that journey which the check in clerk was not impressed by and so on. The next morning I came to breakfast at 10:14am and only to be told that I was too late and that it closed at 9:30. I had to argue it was not the case since it said on the slip around the handle in the room it was until 10:30. This was not enough and thankfully another guest confirmed that this was also the information he was given when the checked in. So the lady instead of apologizing she demanded to the other guest whom it was so she could have a word with the evening guy. Finally she let me grab one pastry and gave me a compote. I was ´´allowed’´ to grab a cup to make a coffee but that was it. So much for the unlimited breakfast.. and she immediately went to write a note in the log for the evening staff, I assume. There is a note in the elevator which says breakfast until 9:30 but the property printed material says 10:30 on weekends and si on. Great welcome from staff, ideally situated for traveling. Very satisfying. Arrived early and staff checked me in early and were pleasant and helpful throughout my stay. Room was clean and cool with air conditioning on at appropriate setting for the hot weather. Breakfast was good, and being able to leave luggage until later was really helpful. The room was clean, bed comfortable and breakfast good. As always, pleasant and helpful staff, very clean and comfortable accommodation and NO noise despite being so conveniently near the station. We will continue to stay here overnight prior to departing from Poitiers station in the morning.